Vicki’s thoughts on Pre-washing or not! 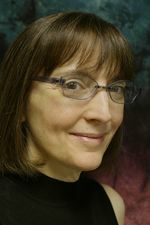 Dear friend Vicki Welsh wrote and offered to share her experience and thoughts on the issue at hand. Vicki is a trusted and dear friend of mine. 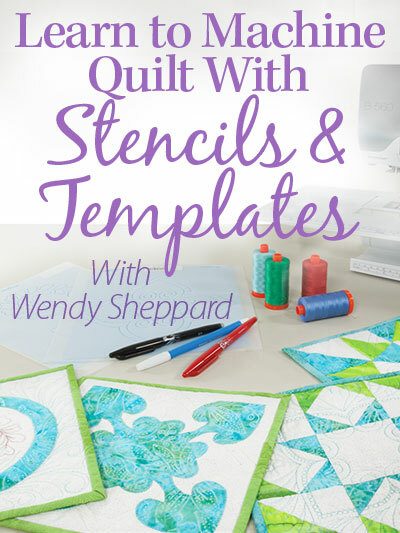 I consider her a very talented quilter, and beyond — you simply have to head on to her blog and find out about the “beyond” part. Vicki is amazingly skilled in many other artsy pursuits. I know I can always count on her for advice! So, I hope you will enjoy what Vicki has to share about pre-washing… and actually soaking your fabrics! Vicki’s generosity to share her experience is just another example of the sweet kindness we show toward one another in the quilting community! THANK YOU, Vicki. To Pre-was or not to pre-wash……Neither! An argument for pre-soaking instead. A couple of weeks ago Wendy polled her readers about whether or not we pre-wash our fabric. I’m visiting here with you today to show you why it doesn’t really matter if you pre-wash or not. If you really want to get the excess dye out of your fabric you really need to pre-soak. I mean really soak…..for hours! I know, you are skeptical. But stick with me a bit and I’ll explain. Even if you don’t agree with pre-soaking your fabric, at the end you will at least know how to deal with a bleeding quilt. 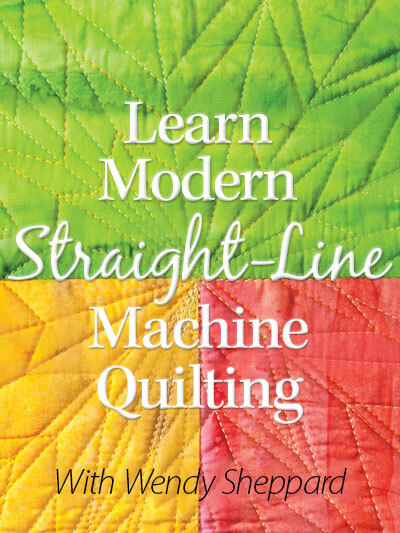 I’m a fabric dyer and I don’t want to sell fabric that bleeds to my quilting customers. Hand dyed fabric has a well-deserved reputation for bleeding and I set out to make mine colorfast. Through lots of experimenting I discovered that soaking the fabric for long periods made the difference. Washing just isn’t enough. Here’s the proof. I soaked some dyed fabric for 12 hours. At 15 minutes, 3 hours and 12 hours I took water samples. I poured the water samples on paper towels and allowed them to dry. 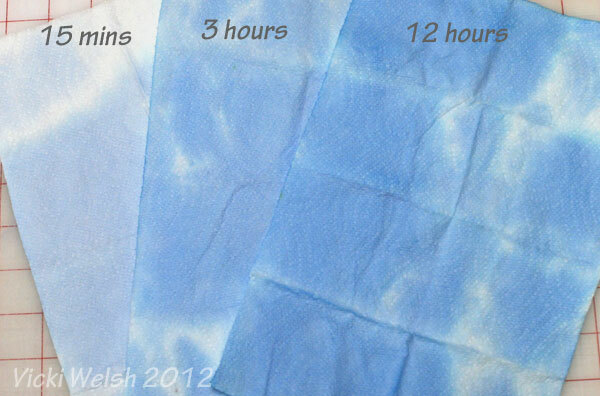 The 15 minutes soak shows how much dye would be released in a typical wash cycle. I think this shows clearly that 15 minutes just isn’t enough. Not long after this I bought a collection of commercial fabrics. I washed them once with a color catcher and the color catcher came out clean. As a test I put the fabric back in the wash and soaked them over night with a color catcher. The next morning the color catcher and water were dark brown! 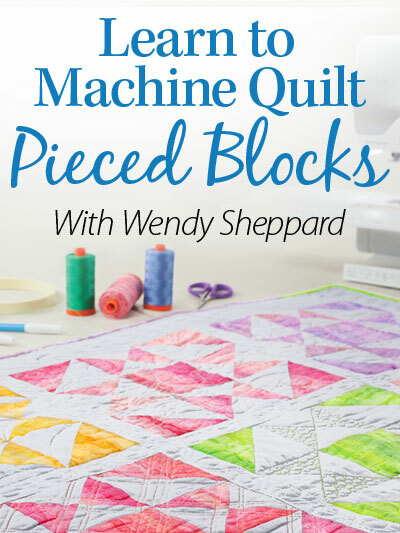 That explained why one quilt of mine bled years after I made it. At some point all of that excess dye will eventually release. You can read the entire post about my soaking tests here. Since that original testing a customer had a quilt bleed (using hand dyed and commercial prints) and around the same time I had a quilt bleed (hand dyed and commercial prints). That gave me the incentive to test the process further, including testing different detergents. You can read all of the details here. I’ve written a summary of the process to remove excess dye from a bleeding quilt and you can print or download it here. You may share the link on your own blog/Facebook page/Pinterest/whatever and you may reprint the article in your guild newsletter as long as it’s reprinted in full and completely attributed to me as the author. I’m a bit evangelical about this and want to get the word out! If you’ve made it this far in the post I think you deserve a reward! If you’ve ever wanted to try hand dyed fabric but have been afraid to use it I want to give you some incentive to try my colorfast hand dyed fabric. All of Wendy’s loyal readers can use coupon code WENDY15 for 15% off your order. The coupon is good through October 15. My favorite fabrics are the ones I created based on the Munsell color wheel and they are always on sale! Good friends don’t let friends piece without properly preparing their fabrics! Vicki, you are a good friend – thank you again for that very educational post. Friends, don’t forget to head on over to Vicki’s blog or shop after you leave here… Thanks for stopping by today. Hugs to you all. Hi Wendy. I never prewash fabric. I had some obvious bleeding fabrics over the years. These fabrics would turn my sewing machine colors. 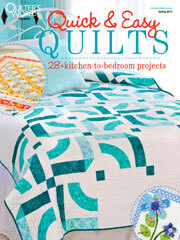 After finishing most my quilts, I wash the quilt in hot water and a cup of white vinegar. ? This process will set the dye and prevent future running of dyes. Am an old fashion gal that likes antique looking quilts. Also, I will know if the quilt can stand up to washing. I do give all my recipients washing instructions to preserve their heirloom. I hope you don’t mind if I interject a bit here. Unfortunately using vinegar to set dye is an old wives tale. It probably came out of a process of using natural dyes. Salt added to the wash is another one that people sometimes use. Not are quoted very often. Neither of these do anything to help set modern dyes. The best thing we can do is to make sure that we get all of any excess dye out of the fabric to prevent future bleeding. Thank you for the amazing post! I have been working under the delusion that my pre-washing of new fabrics is enough to stop my finished quilts from bleeding. I have bookmarked Vicki’s article and presoak method for future reference. I plan on presoaking all new fabrics for future projects. I invest too much time, money and love into my quilt creations to have the dyes run. 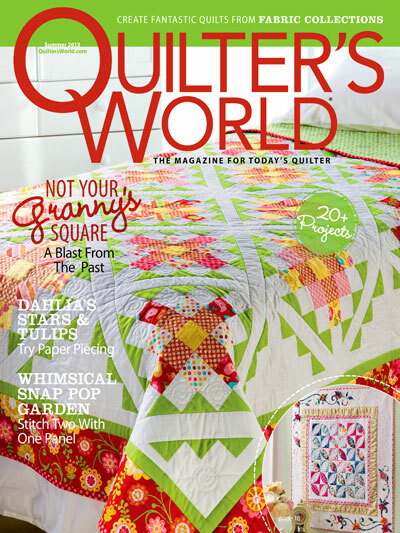 May I share this with my quilter’s guild? What great information! Thanks to both you and Vicki for bring this subject to the forefront. I wash, and I use color catchers… sometimes more than once is necessary. Next time I’ll just do a long soak! I think I’ve read that Dawn detergent acts as a ‘sufficant’ holding the dye away from the fabric similar to what Synthapol does? Thank you for mentioning the vinegar with wool dyeing. Vinegar is the fixative for acid dyes on wool and silk for sure. It just doesn’t do anything for cotton. Also, yes, Dawn and (any other detergent) is a surfactant like Synthrapol. It suspends the dye particles in water, away from the fiber. In my testing I found that Dawn worked even better than Synthrapol on commercial fabrics. Some commercial fabrics seem to attract dye and Dawn worked best to keep those fabrics from attracting more dye. Well Vicky.. I sure mutiflated that “surfactant” word. I’ll be certain to remember it next time. :-) Thanks again for your information. I’ve printed it out and will keep it to refer to in my files! I also added your pin with this info onto my Pinterest board. Now THAT was a typo… “mutilated”. Fingers are not working well so late. What a great read!!! Thank you so much for the information. I will definitely be using this technique from now on. Definitely “food for thought”!!! I don’t prewash as I want the total shrinkage and I go through a ton of Color Catchers. I probably will have an unpleasant outcome one of these days, but………………………. Thank you Wendy and Vicki for this fantastic information. Most of my quilts are mini and don’t get washed (or soiled ?? fingers crossed)… Seriously though — thank you for sharing. I once visited the Airing of the Quilts in Tunkhannock, PA and saw a beautifully done Baltimore Album Quilt outside with the damp air making the reds run… Oh it was heartbreaking. My golly, what an eye-opener. How does Orvus Paste fit into the mix? I prewash my fabrics using it along with a color catcher. Vicki, do you use Dawn in the washing machine? What about the newer HE washers, what do you suggest because you are supposed to use low suds soaps? Or do you soak in a pan or the bathtub? So many things to think about. 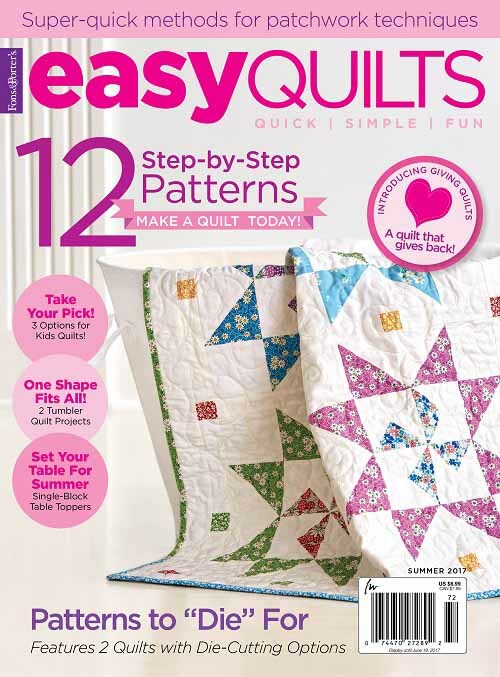 But as it was mentioned, so much goes into making quilts…….time, money, heart, and soul. I have not tested Orcus but you could easily set up a test to try as many other soaps as you want. My links above talk in detail about how I did my tests and what soaps I tested. It also talks about HE washers. They are of no use in dealing with bleeding fabric. You need lots of water so if you have a HE washer you will need to soak in a big sink or tub. Wendy, even if I don’t comment, I am always lurking! hahaha! Lurking is such a bad connotation word, but when used in the blogosphere, it’s funny to me! Thank you so much for the links to Vicki Welsh. Seems full of really useful information. Signed up to follow. Found you through Linda Franz and now the trail continues. This is great information and thanks so much to both of you for sharing the knowledge.